Exciting experiences and spectacular scenery await you on this New Zealand Vistas tour. Leave Auckland behind you and marvel at the wonders of Waitomo Caves, continue onto Rotorua and discover active geysers, boiling mud pools and the traditional Maori culture. Your journey will then take you to the sights and sounds of the South Island, the world famous TranzCoastal Train, Te Anau and the glorious Milford Sound, to name but a few. This morning see roaring geysers and boiling mud pools at the thermal area, tame trout at the springs and performing sheep and dogs at the Agrodome. Your afternoon is free, there are many activities to enjoy. Travel south to Wairakei, wreathed by steam, then to the picturesque township of Taupo. Skirt Lake Taupo and cross the volcanic landscape of the Desert Road past the majestic peaks of Tongariro, Ngauruhoe and Ruapehu. Continue across the fertile plains of the Manawatu and along the rugged Kapiti coastline to Wellington. Stay 2 nights in Wellington. A morning tour of the city will take in the Parliament Buildings, Old St Paul's Cathedral, Mt Victoria and an optional ride on the cable car. This afternoon is free to enjoy our capital city. Cross Cook Strait by ferry to the Marlborough Sounds and Picton. The TranzCoastal train skims the spectacular coastline between the Kaikoura ranges and the Pacific Ocean. Continue through North Canterbury sheep country to Christchurch arriving in the evening. Stay 1 night in Christchurch. Travel south across the Canterbury Plains through seaside Timaru and historic Oamaru to Dunedin “the Edinburgh of the South”. Please note, no commentary is provided on this journey. Continue south across the rolling hill country of South Otago and Southland. After the farming community of Gore, head across the Waimea plains to Te Anau, gateway to Fiordland. Stay 1 night in Te Anau. Pass through pristine beech forests and the Homer Tunnel to view the majesty of Mitre Peak and Bowen Falls aboard a cruise on the Sound. Depart Milford Sound back to Te Anau, the turn north following the dramatic southern shores of Lake Wakatipu to reach Queenstown by early evening. Stay 2 nights in Queenstown. Today is free for you to enjoy this fabulous lakeside resort. We have included the Skyline Gondola in your tour. There are dozens of optional activities from thrilling jetboat rides to leisurely lake cruises, 4WD safaris and bungy jumping. Travel through the Kawarau Gorge with its historic gold mines, then past the stone fruit growing region of Cromwell to the Lindis Pass. 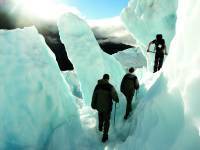 Cross the spectacular Mackenzie country bounded by the Southern Alps to Lake Tekapo. Continue north through the Canterbury Plains arriving into Christchurch late afternoon in time for your flight to Auckland. Your tour ends on arrival at Auckland Airport.